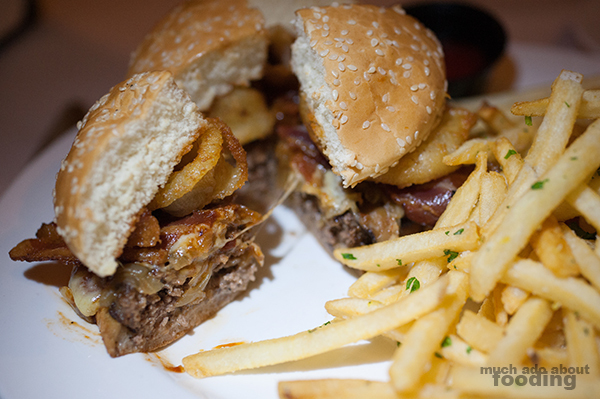 On our trip to San Jose, I looked around for restaurants that were getting good ratings and reviews on multiple sites. 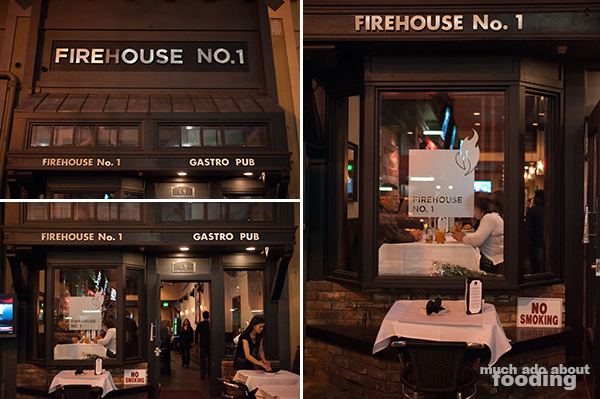 I came across Firehouse and checked out their website; the menu read like an exciting story. "A gastropub?" I thought. Well I've been to a few in my home area and have liked them every time. Why not given a norCal place a try? I ended up making my meet-up spot here too for all of my friends I was to see during my trip (gaming friends and fellow Duke alumi). Also, the restaurant touted itself thus: "Firehouse is simply the greatest place EVER to come for food and drinks on any occasion. The comfortable atmosphere, insanely delicious food, handcrafted cocktails and fine brews brings everything together ever so nicely." Has to be good right? It pretty much ended up being a four-couple hangout as everyone brought their significant other. 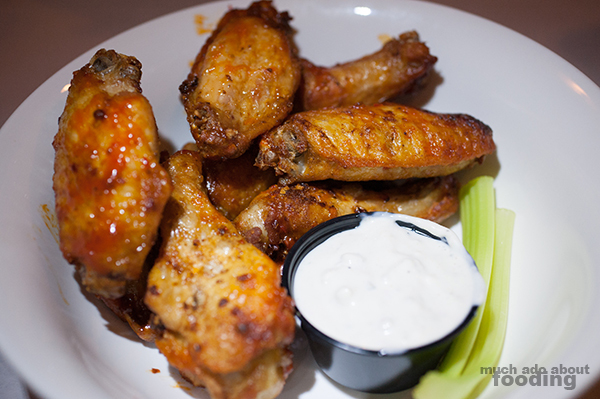 One couple had already put in an order for the Spicy-Smokey Wings ($10.50 - tossed in FH1 buffalo sauce alongside celery and Bleu cheese) when we got there. When the dish came to the table, it was not steaming hot. I didn't realize this until it got to my turn to have some, and they weren't too warm at that point. Unfortunately, though I looked for a spicy smokiness, the sauce was forgettable. $10.50 for these wings seemed too ambitious. Duc went ahead and ordered The Duke Burger ($12.50 - beef patty with bacon, BBQ sauce, onion rings, and Cheddar cheese), of course. He always does every time we go somewhere that has a "Duke burger." Unlucky for him, it was hard to justify the price for this burger as the meat's quality was practically negligible, having been drowned in BBQ sauce. The bacon and onion rings tried to make up for it but that sauce was overpowering. Good fries though. 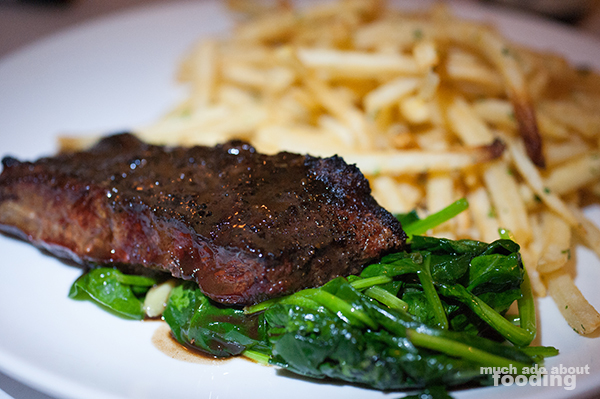 My friend put in an order for their Mustard Rubbed Flat Iron Steak ($19 - served in a red wine shallot sauce alongside French fries and lemony spinach), medium well. He asked how big it was prior to ordering, and our waitress only showed him an approximate size with her hands, not an ounce measure. We could hardly taste the seasoning which would have been fine had the steak been of great quality or cooked perfectly but it wasn't; dinnermates even asked for A1 steak sauce. That's never a good sign. The French fries were good though and I didn't taste the spinach so can't give a recount of it. 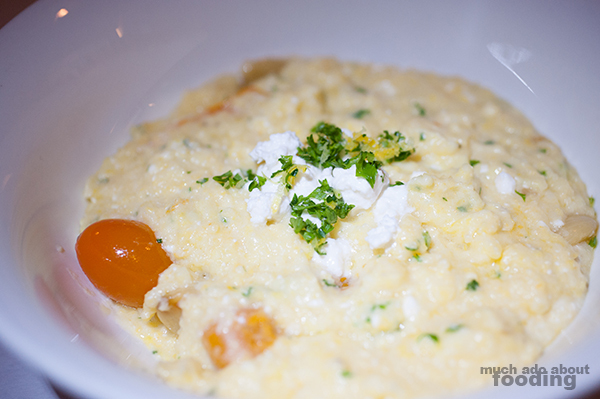 I opted for their Baked Polenta ($6 - combined with heirloom grape tomatoes, Feta, roasted garlic, and fresh herbs) which we all flat out disliked as the tomatoes were too sour for how creamy and savory the other ingredients were. No one else enjoyed it, and it was a bad first polenta experience for some. I hate wasting food but this was hardly touched and with good reason. 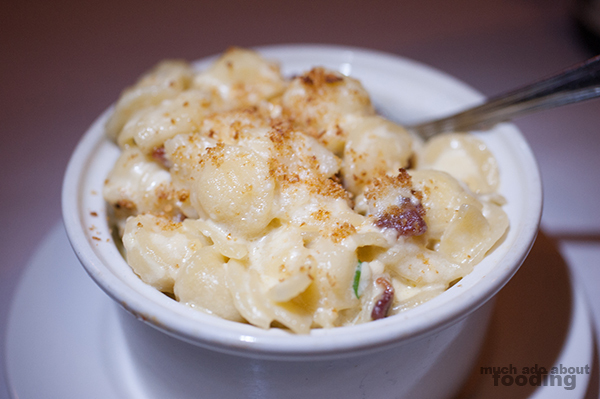 Duc also grabbed an order of the Bacon Mac N Cheese ($11 - made with smoked Gouda, Cheddar, Pecorino Romano, and fresh breadcrumbs) for the table. It turned out to be very expensive considering that I've had pricey bacon mac n cheese at other gastropubs which probably come in 25%+ lower in price but still better in quality. I hate sounding like snobby when it comes to things like that but with the some-too-hard and some-too-soft pieces of pasta (how does that happen?) and off taste of cheeses without much bacon-y flavoring, I had to be that way. It was also a little too gritty for my taste. 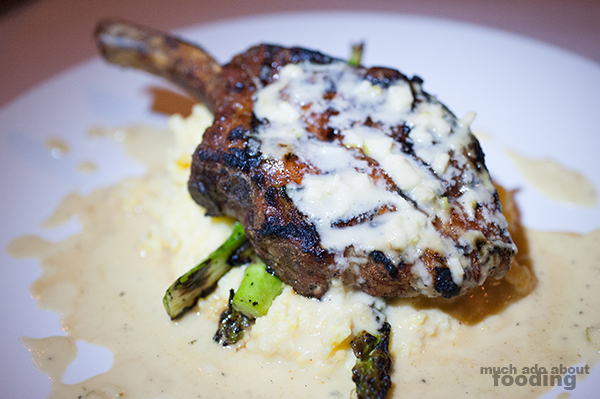 Lastly, a friend ordered the Grilled Bone-In Pork Chop ($16.50 - served with a green apple vinaigrette on top of creamy polenta and asparagus). The dish was bland and a bit dry. It's a common mistake that occurs with pork chop I've noticed so I wasn't all too surprised. This one's polenta was great however so I did have a few bites of that. I didn't get to try the asparagus. 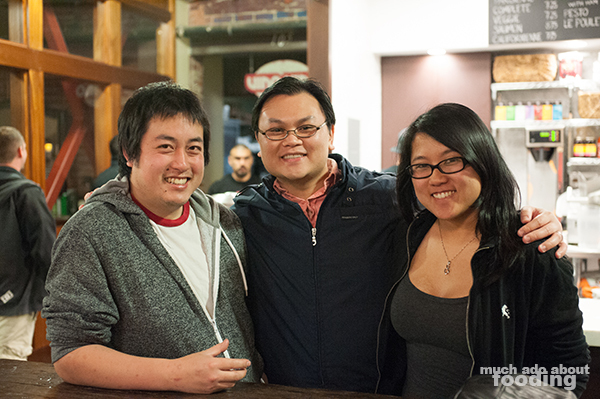 Friends I used to game with a few years back - first time we've met! I guess the main reason why I had wanted to go there was also to check out local brews on tap and guess what? They didn't have it! Firehouse was set up like a gastropub in the back but the emphasis seemed to be the bar in the front (hence a tad slow service). I came away disappointed because everything online seemed good, and I commended the use of seasonal ingredients. Why the rating that wasn't a complete zero? Well none of the food was inedible, and in general, the environment was good. There were some pluses here and there, so I can't more harshly drop my rating. I normally would have let our waitress know about any issues we had with the food but when I realized it was everything that the majority of us disliked, I figured it just meant the place wasn't for us. Ah well.